The Big Island’s Kilauea Volcano has almost continuously erupted since since 1983. According to the Hawaii Volcanoes National Park, these lava flows have added over 568 acres of new land and covered over eight miles of highway with lava as deep as 115 feet. Witnessing Kilauea Volcano in action is one of the most amazing sights I’ve ever seen. 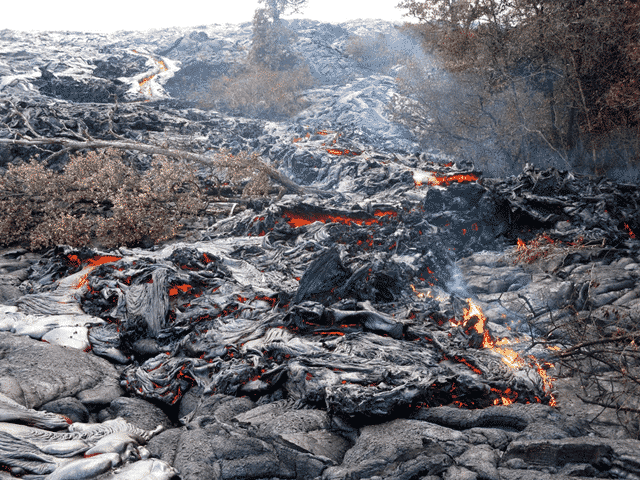 See my tips for watching lava flow. Note that the photo of lava flowing through the Royal Gardens subdivision from the USGS Hawaii Volcanoes Observatory.